The Media and Financial Crises provides unique insights into the debate on the role of the media in the global financial crisis. Coverage is inter-disciplinary, with contributions from media studies, political economy and journalists themselves. It features a wide range of countries, including the USA, UK, Ireland, Greece, Spain and Australia, and a completely new history of financial crises in the British press over 150 years. Editors Steve Schifferes and Richard Roberts have assembled an expert set of contributors, including Joseph E Stiglitz and Lionel Barber, editor of the Financial Times. The role of the media has been central in shaping our response to the financial crisis. Examining its performance in comparative and historical perspectives is crucial to ensuring that the media does a better job next time. 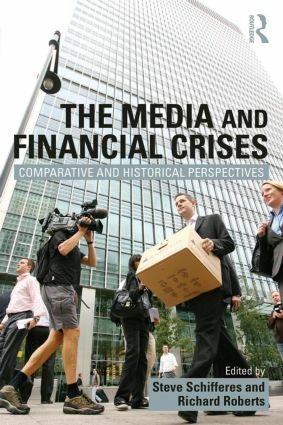 The Media and Financial Crises offers broad and coherent coverage, making it ideal for both students and scholars of financial journalism, journalism studies, media studies, and media and economic history. "This elegantly conceived and meticulously executed collection scores a palpable double hit: deepening our understanding of financial crises and transforming our knowledge of financial journalism. Above all it marks a historiographical step-change through its sophisticated reading across the last two centuries of that elusive but symbiotic relationship between the ‘actors’ (whether individuals or markets) and their interpreters in the media. To anyone seriously interested in financial matters, this is a mandatory text." "This is a cogent and multidimensional examination of business and financial reporting during times of economic crises and commercial fiascos. It provides insightful and integrated analysis of the roles, quandaries and performance of media during economic shocks across the past two centuries and is a compelling appraisal of how media cover and influence economic, financial, and commercial activities and public responses." "The media and the financial sectors are both criticised for being over-powerful and lacking public accountability. This collection of essays - from some of the most knowledgeable academics with experience of both fields - tackles that issue head-on and is essential reading for anyone interested in the role and effectiveness of business journalism." Steve Schifferes is Marjorie Deane Professor of Financial Journalism at City University London. He covered the financial crisis for BBC News. Richard Roberts is professor at the Institute of Contemporary British History, King’s College London. Publications include studies of HSBC, Schroders, the City, Wall Street, Bank of England and Equitable Life.